I've always been a bit of a bookworm and I still am! I'm pleased to say both my little people seem to be the same too! I think I was about 7 or 8 when I first read my Dad's copy of J.R.R. Tolkien’s The Hobbit, I remember spending hours studying the maps printed into the book and I really loved the characters. It's a book I've returned to at various points in my life along with the Lord of the Rings. I can't wait to see the new film The Hobbit out in December, I know the book will always hold a special part in my heart. I was really happy to be sent a review copy - its been a while since I read the book last - at least ten years and I no longer had my own copy. 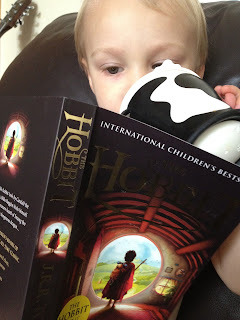 I've really enjoyed reading parts aloud to my little boy, he loves the opening parts describing the home of the peaceful bilbo baggins and just like me, loves to study the maps! He's also into dragons but I'm mindful what I read about Smaug to a 3 year old! I've really enjoyed rekindling my love for this story, filled to the brim with adventure, mythical beasts and magic! I have 2 copies for my lovely readers to win so you can read them to your children too! Two readers will win one copy each, sent out directly from the lovely PR lady. Comp closes at 12noon on Monday 27th August! 'Balrogs, Kind of Doriath' according to a LotR generator. I would have hoped for something more glamorous! Mine would be "Myrtle the magnificently bland" Wizards should be cool, but yet I so am not. I have liked on facebook, followed and tweeted on twitter. Gormadoc River Folk. River Folk, family of Stoors living on the banks of the Anduin, with a matriarch (Gollum's grandmother). Smeagol and Deagol belonged to this family. I would be RICH the POOR-BUT-HAPPY! My 5 year old Step sons wizard name would be Castarno, because it sounds like a strong and powerful name! Bless. At my vast age I would be Wetleg The Incontinent. According to the LOTR name generator, I'm Annatar The Great. I like that, I might demand the folk at work call me that tomorrow. Following on GFC as well. I think Katie the Dreadful has a nice ring to it! I guess if I were a wizard naturally I would be called "a wizard" but I would want to be recognised throughout the lands as L'Aubergine Violet ... I have no specific reason, but I think it has a ring to it? does it not? I've enjoyed reading all your entries :-) some really fantastic wizard names!